Published: July 23, 2017 at 04:47 p.m. Updated: July 24, 2017 at 10:04 a.m.
GLENDALE, Az. 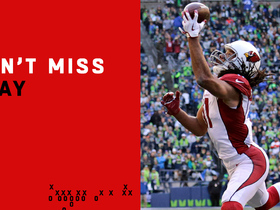 -- Veteran Cardinals wide receiver Larry Fitzgerald isn't going into this season as if it will be his last. 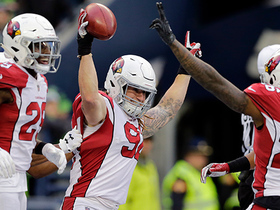 Fitzgerald has broached the subject of retirement the past few offseasons -- including this one -- but he's back for his 14th, all with the Cardinals. He said his confidence remains as high as ever and feels that he'll be as effective as ever. Why wouldn't he after coming off a 2016 season in which he had 107 catches, 1,023 receiving yards and six touchdowns? "I can still play at a high level," Fitzgerald said Sunday, Day 2 of Arizona's training camp at University of Phoenix Stadium. "If my number is called I can still make a play." Fitzgerald continues to be the Cardinals' top receiving threat, although he plays mainly from the slot and isn't the deep option that he was earlier in his career. He's also one of the most respected players of this era, especially because of his humility, tenacity and willingness to do everything from outleap defenders for a jump ball to blocking outside linebackers on a sweep by running back David Johnson. But, that "R" word. It's hanging over him now more than ever. He turns 34 in August and said quite honestly that, "most athletes don't retire, they get retired." Fitzgerald wants to drop his own mic. He's already spoken with Patriots quarterback Tom Brady, who is still playing of course, but also retired future Hall of Famers Peyton Manning and Tony Gonzalez about when they knew to keep playing and when to hang it up. They each had various reasons -- some physical, some because they had other interests -- but each told him that they knew when to stop and when not to. What was most intriguing about Fitzgerald's lengthy question and answer session about retirement with reporters Sunday was that he said he didn't want to end his career as a shell of himself. He referenced NBA legend Michael Jordan trying to hang on for one last run with the Washington Wizards, Shaquille O'Neal gasping for one last shot with the Celtics and Pro Football Hall of Fame running back Tony Dorsett fading out with the Broncos. Fitzgerald cited Lions wide receiver Calvin Johnson and NBA great Tim Duncan as players walking away from competition with more left than just their dignity. They could have played longer, he said, but retired before Father Time took away their full effectiveness. "I feel good now," Fitzgerald said. "When that changes, I'll let you know." Fitzgerald also said when he does retire, it will come with no fanfare. Until that day, Fitzgerald plans to continue being the stellar player and teammate that he always has been. 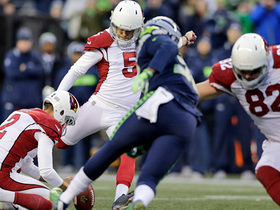 Coach Bruce Arians knows how valuable Fitzgerald is and isn't going to put him in harm's way early in the preseason. Fitzgerald and quarterback Carson Palmer already have been ruled out of next week's Hall of Fame game with the Dallas Cowboys. Fitzgerald told me that he's also been cleared by the team to remain in Canton, Ohio, for a few extra days to watch former Cardinals teammate and friend Kurt Warner get inducted into the Hall of Fame. There is no doubt Fitzgerald will join Warner in Canton one day. Fitzgerald really has nothing else to prove to anyone but himself that this season, he is still one of the NFL's Elite.